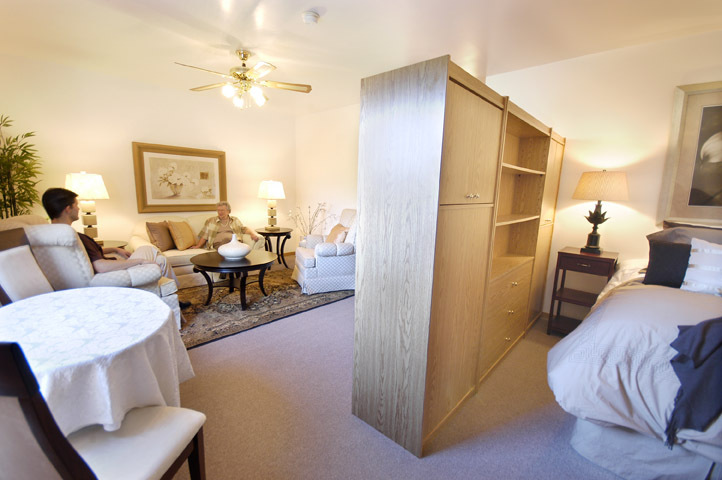 Catherine Place Retirement Community offers various sizes of suites ranging from cozy bachelors to spacious large one bedrooms. 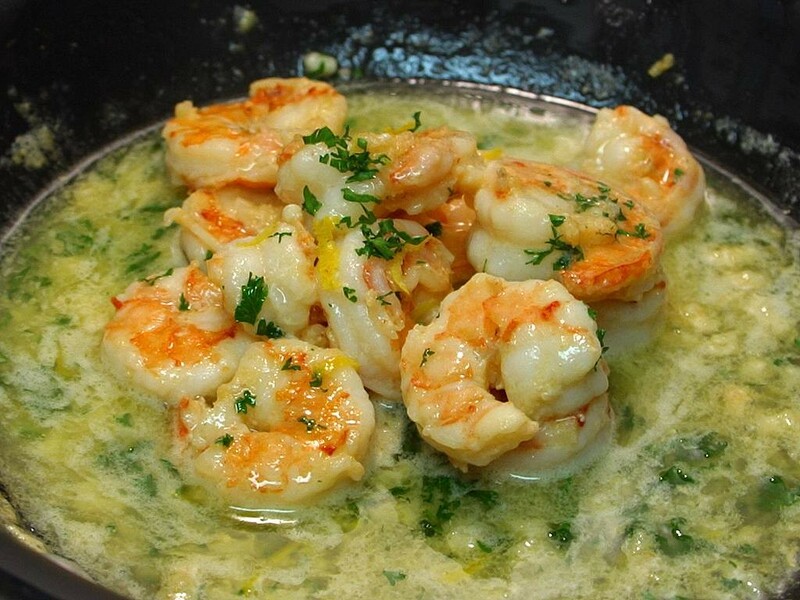 Catherine Place’s specialty is our food. Our tenants are treated to the very best in fine dining in our 24 hour dining room. Eat better than you did at home, all the time! This is the way you deserve to live! Come on in to the best food, the best service, best price, and best value in the city of Winnipeg, all included in your rent! This is our personal guarantee to you. 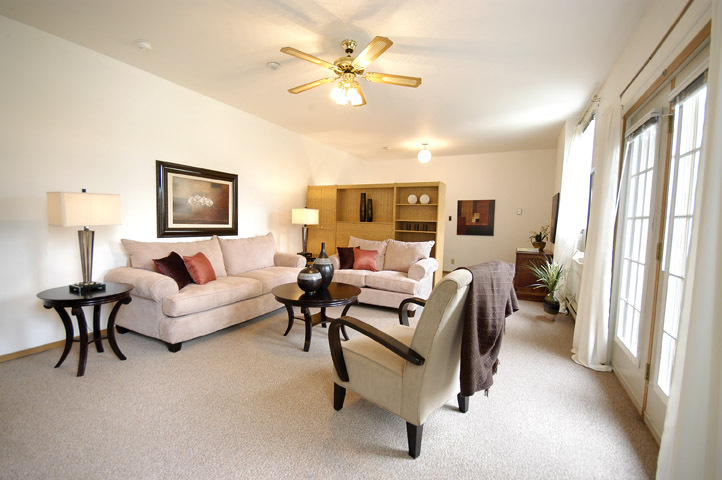 You will not find a seniors apartment retirement community like this anywhere else. “Thank you for your chats, your kindnesses to me and especially to my Mom, and thanks also for the positive atmosphere that prevails at Catherine Place." 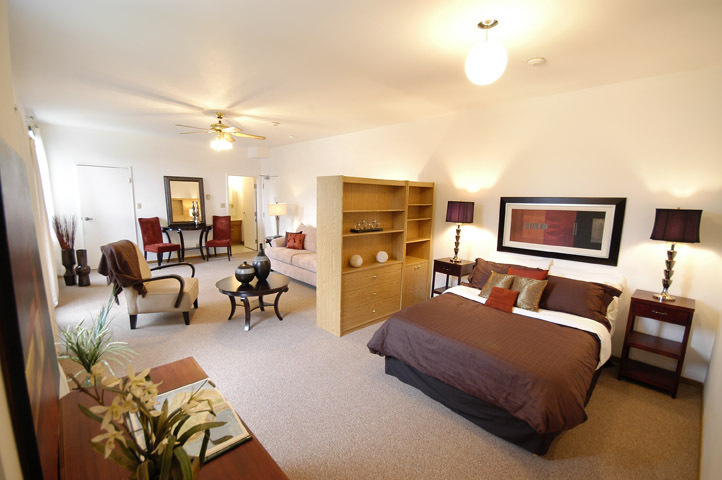 Catherine Place Retirement Community offers various sizes of suites ranging from cozy bachelors to spacious large one bedrooms. You can decorate to your hearts desire! 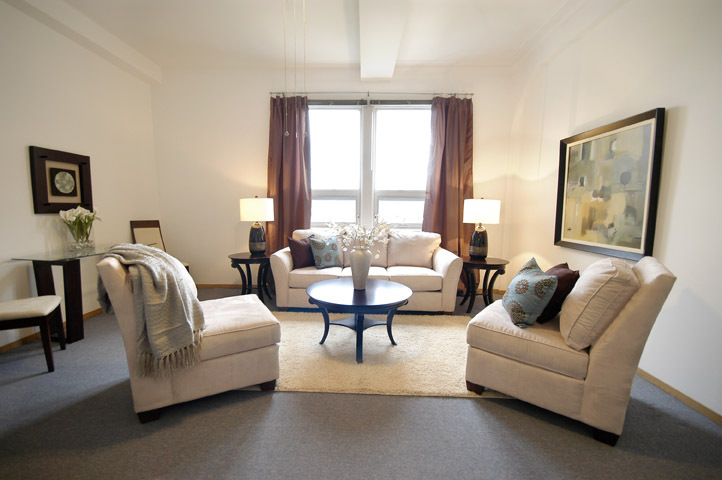 Browse through the partial selection of small, medium and large suites shown here to see which one matches your particular lifestyle needs. 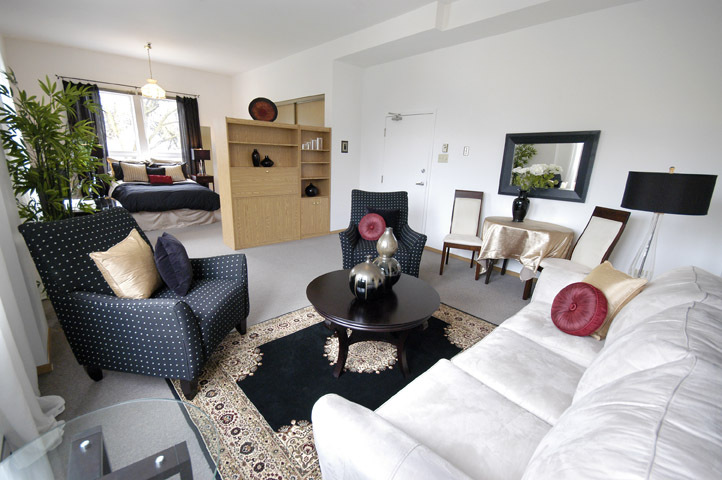 Whatever your requirements may be, Catherine Place has a suite that is just right for you! 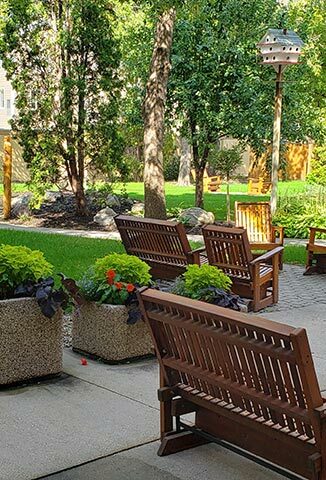 Conveniently located on more than an acre of landscaped grounds in a quiet residential neighbourhood away from the noise of traffic, close to doctors, hospitals, churches and shopping, sits Catherine Place, a retirement community especially designed for seniors who seek a better quality of living. Catherine Place tenants enjoy the professionally groomed gardens. 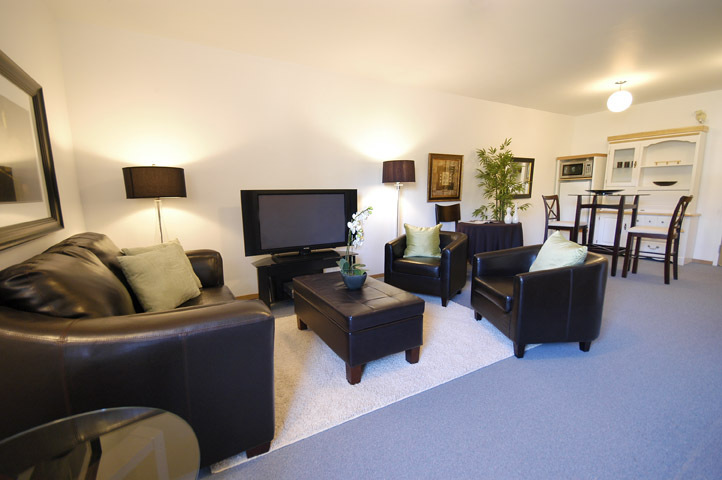 Ample parking is available for both tenants and guests. Two elevators provide easy access to each of the 102 apartments, and the large activity centre is a great place to meet new friends or to entertain visitors. A grand dining room is accessible 24 hours. Our efficient staffing of approximately 20 employees consists of 6 long term staff in all departments - management, maintenance, kitchen, housekeeping, and night custodian - from 13 to 24 years of service. 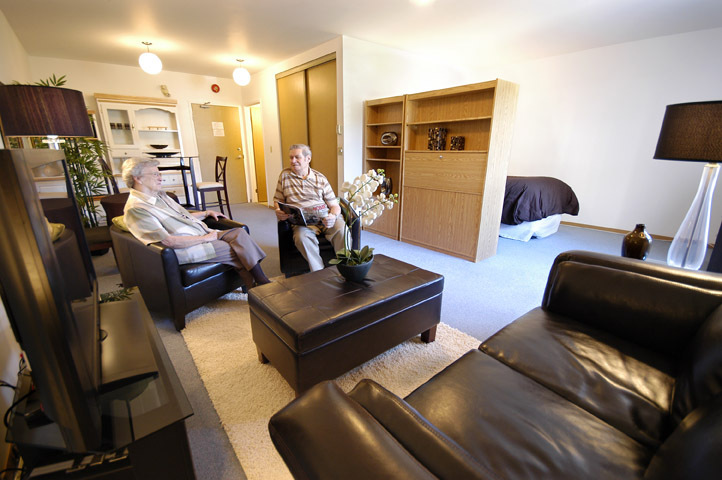 This ensures more peace of mind for tenants and for their families. 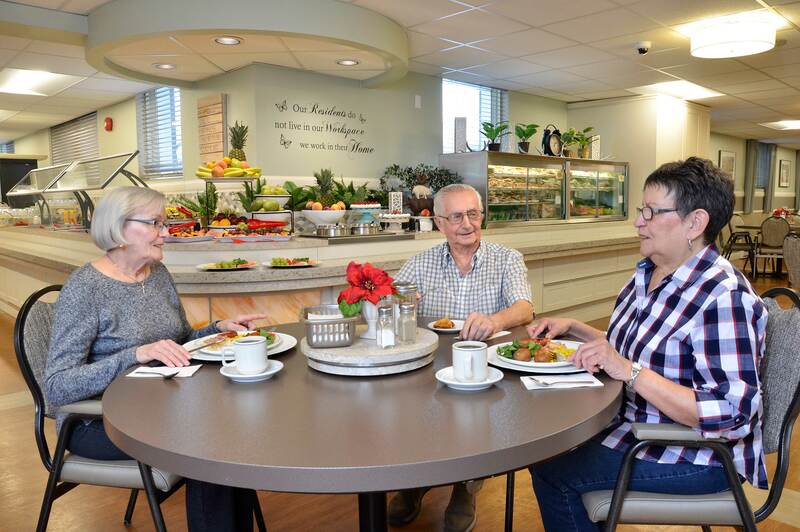 We are on our third decade in the assisted living business in Winnipeg and are not bound by high construction costs so we are in a better position to offer our tenants the best quality and variety of food, the best services at the best price. Nothing is too good for our tenants. This is our guarantee! 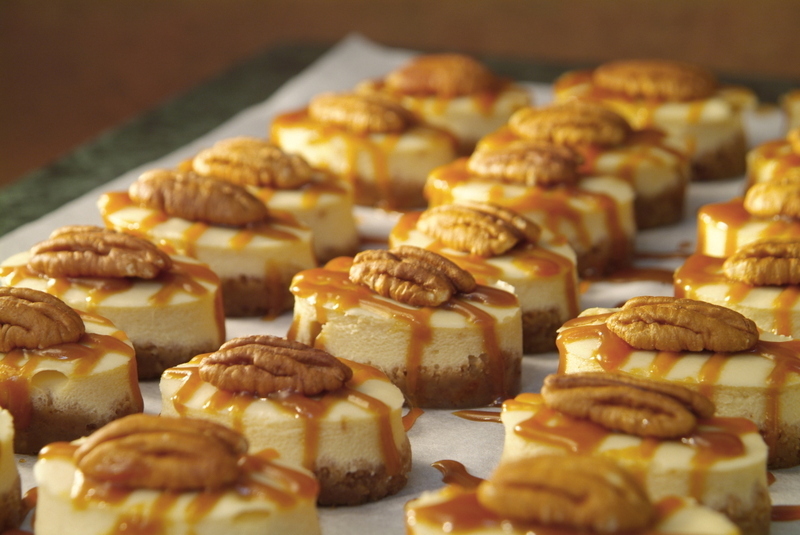 Catherine Place’s specialty is our food. Our tenants are treated to the very best in fine dining in our 24 hour dining room. Eat better than you did at home, all the time! 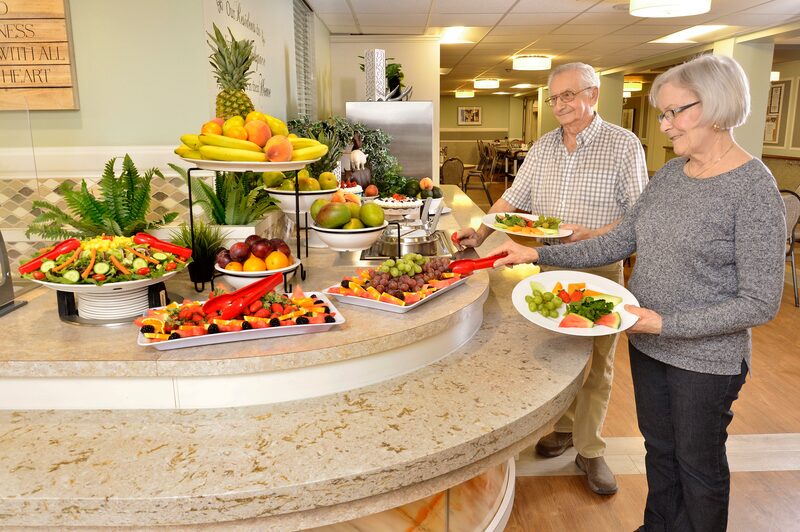 Our dedicated chefs’ sole responsibility is to prepare a variety of tasty, nutritious meals and to meet our tenants’ special dietary needs on an individual basis (low sodium, diabetic, gluten-free, food aversions and allergies). 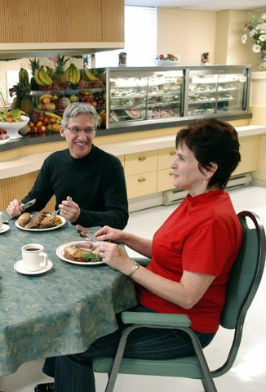 Fine dining at Catherine Place, a 55+ seniors apartment complex and assisted living retirement community. Using only the finest cuts of meat, such as Angus beef, and Manitoba fresh pickerel, Arctic char, rainbow trout, Atlantic salmon, each meal provides excellent nutrition and exquisite taste for your palate. Only the freshest fruits and vegetables are offered, in a selection equivalent to your local supermarket. 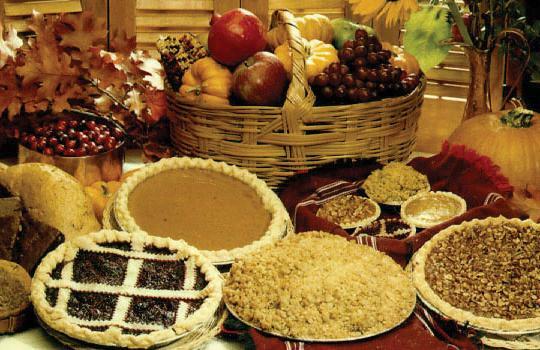 Home-baked pies, dainties, cakes, puddings, muffins and cookies make a wonderful end to a delectable meal. All special occasions, such as Christmas, New Year’s Day, Easter, Mother’s Day, Father’s Day, and Thanksgiving, are afforded extra attention. Our chefs take great pride in presenting a feast-like gourmet banquet with special treats for our tenants and their guests. 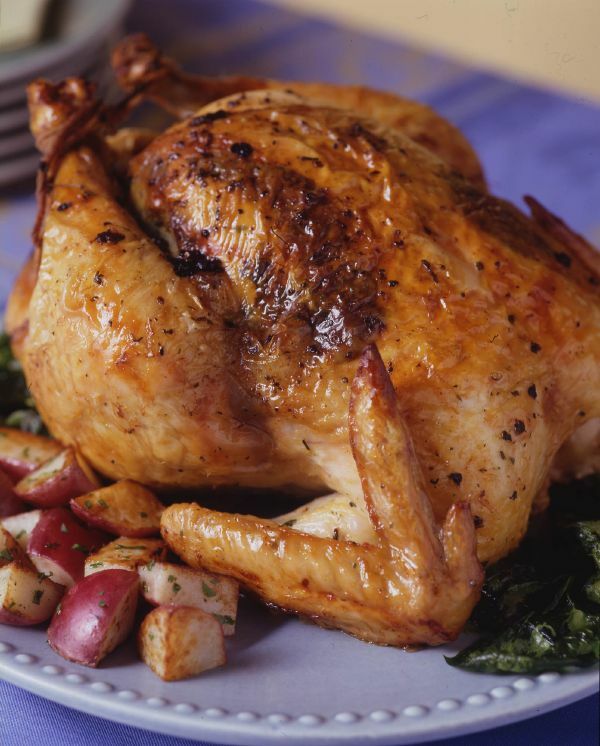 Whatever your food requirements may be, we take away any and all reasons for you not to be fully satisfied. You will find our dining room staff’s special caring attention exceeds your expectations! Don’t forget, when you live here, the whole building is your home! 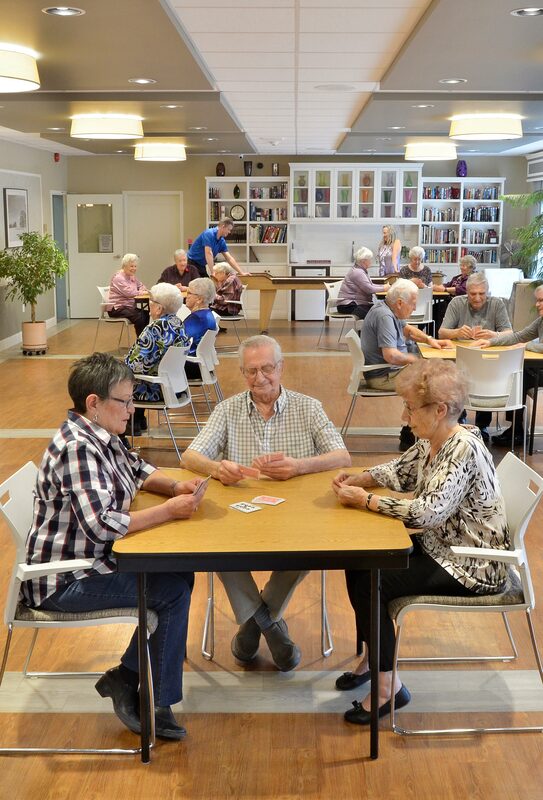 Come on in to the activity room and play cards, bingo, or shuffleboard. Join the group in the exercise program. Take part in various church services. Grab a book from the library or join in on the friendly game of cribbage, whist or bridge. There is something for everyone. The spacious dining room is open 24 hours a day for your convenience. This is your home: you decide what you want to eat. 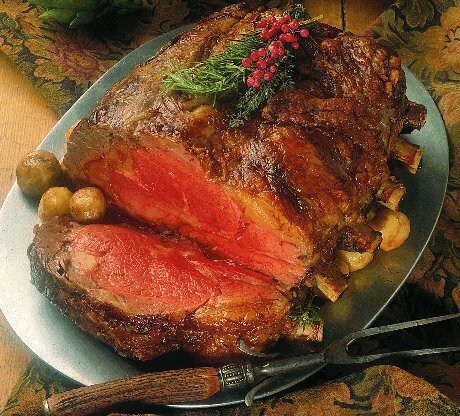 Whether you want a midnight snack or a steak for supper, our chefs will prepare what your taste buds desire. 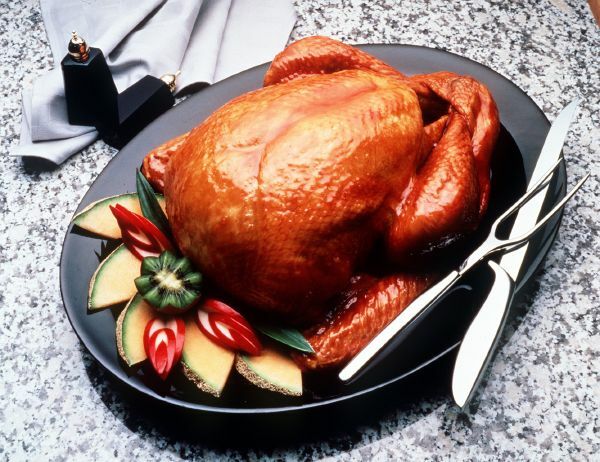 Whatever your food requirements may be, we take away any and all reasons for you not to be fully satisfied. 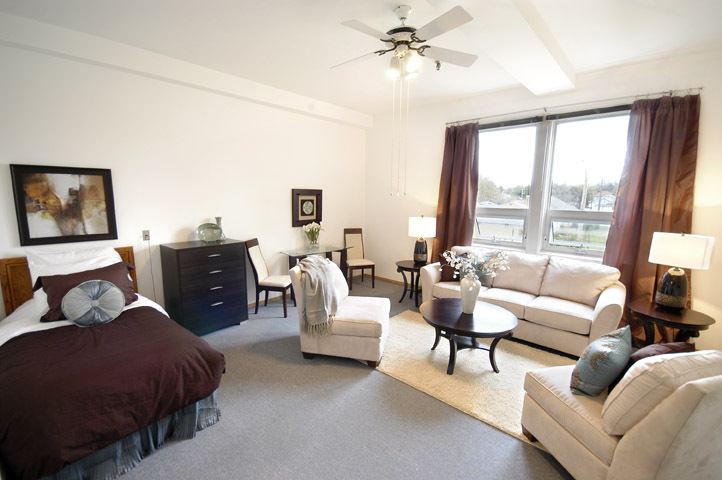 A sophisticated security system combined with personnel around the clock assures peace of mind to tenants and their family. This includes emergency call buttons and necklaces, and a two-way intercom system to call between the rooms and the office. Help is always a push of the button away. There are security cameras in all hallways and common areas. 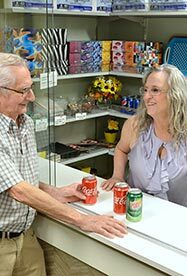 Convenience store on site for incidentals open during regular office hours. We carry things like stamps, envelopes, laundry soap, toothpaste, batteries, toilet paper etc. Don’t go out if you don’t have to. We have it all here for your convenience. 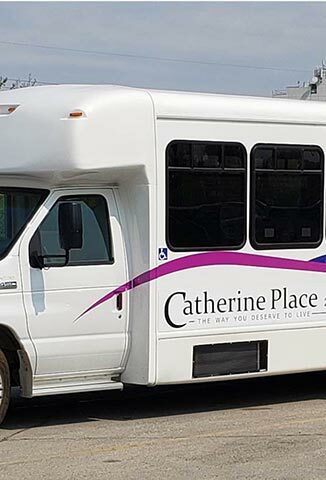 Weekly scheduled transportation on our shuttle bus to St.Vital Centre. Let us do the driving while you sit back and enjoy the ride. Enjoy the afternoon in our beautiful landscaped garden. Sit, relax and enjoy the peaceful surroundings. 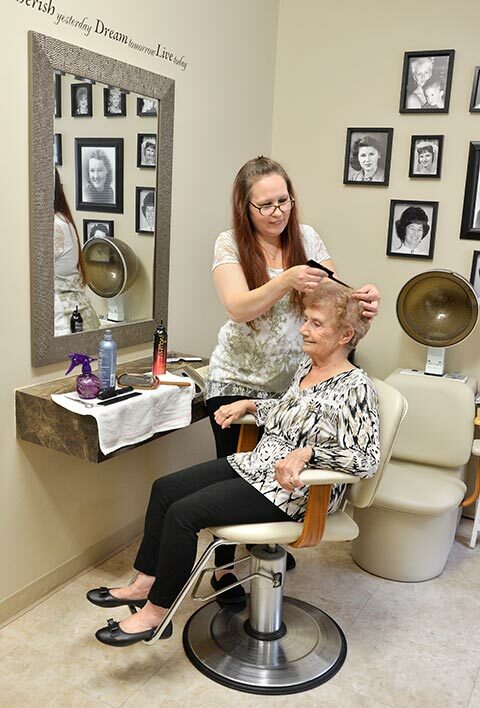 Catherine Place seniors complex offers something for everyone to enjoy. Plant your own garden box and enjoy the summer watching your flowers and vegetables grow. There is an on site hairdresser. Just pick up the phone and make your appointment. No more having to take a taxi or a bus to get there. Family can rest assured that you can carry on with your daily routine without their assistance. Meet your friends in the garden and sit back and reminisce. This is what retirement should be! Catherine Place Retirement Community would like to take this opportunity to show you what you are missing. Compare for yourself! Call or e-mail us today to book your guided tour. © 2014 Catherine Place All rights reserved.